HOT BOYS REUNION? “There’s four different people, you know, so there’s negotiations from four different angles. I’m ready to do it if they’re ready to do it. It’s easy for us four to get in the room and agree to do it, but since pretty much everybody is signed with a different record company, we’ve got to work that out first. But Baby don’t have no say-so. That’s part of the deal. Everybody wants to do it, but they fact is, they don’t want him involved. That’s how the whole thing came to be. 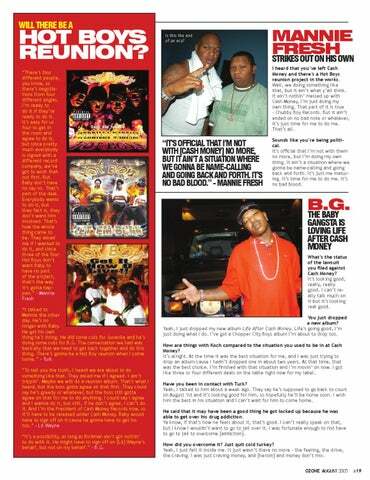 They asked me if I wanted to do it, and since three of the four Hot Boys don’t want Baby to have no part of the project, that’s the way it’s gotta happen.” - Mannie Fresh “I talked to Mannie the other day. He’s no longer with Baby. He got his own thing he’s doing. He did some cuts for Juvenile and he’s doing some cuts for B.G. The conversation we had was basically that we need to get back together and do this thing. There’s gonna be a Hot Boy reunion when I come home.” - Turk “To tell you the truth, I heard we are about to do something like that. They asked me if I agreed. I ain’t trippin’. Maybe we will do a reunion album. That’s what I heard, but the boss gotta agree on that first. They could say he’s greedy or whatever, but the boss still gotta agree on that for me to do anything. I could say I agree and I wanna do it, but still, if he don’t agree, I can’t do it. And I’m the President of Cash Money Records now, so it’ll have to be released under Cash Money. 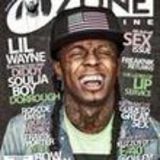 Baby would have to sign off on it cause he gonna have to get his too.” - Lil Wayne “It’s a possibility, as long as Birdman ain’t got nothin’ to do with it. He might have to sign off on [Lil] Wayne’s behalf, but not on my behalf.” - B.G. MANNIE FRESH STRIKES OUT ON HIS OWN I heard that you’ve left Cash Money and there’s a Hot Boys reunion project in the works. Well, we doing something like that, but it ain’t what y’all think. It ain’t nothin’ messed up with Cash Money, I’m just doing my own thing. That part of it is true – Chubby Boy Records. But it ain’t ended on no bad note or whatever, it’s just time for me to do me. That’s all. Sounds like you’re being political. It’s official that I’m not with them no more, but I’m doing my own thing. It ain’t a situation where we gonna be name-calling and going back and forth. It’s just me maturing. It’s time for me to do me. It’s no bad blood.